It is of utmost importance to backup or digitize DVDs in multiple formats to ensure that you don’t lose costly software or precious memories. It also helps in protecting the DVDs from scratch, damage or loss. You can also watch DVD movies on the move. MacX DVD Ripper Pro is the best DVD backup and ripping software to copy and digitize all types of DVDs (new DVD, 99-title DVD, damaged & unplayable DVD) to protect your DVD collection from scratches and save shelf space. It converts DVDs to any video files for playing on Mac, iPhone, iPad, Apple TV, iTunes, QuickTime, PS4 and Android devices or streaming from Mac/NAS to HD TV. With unique level-3 hardware acceleration technology and High-Quality engine, it can rip a full DVD to a slew of iOS devices in only 5 minutes with lossless quality. The software rips the DVDs/ISO images/folders in all sorts of formats including DVD to MP4, MP3, QT, FLV, MPEG4, AVI, MOV, HEVC/H.265, H.264, etc. It is easy to use. Both beginners and advanced users can work with the customizable conversion settings. The broad range of supported devices is yet another terrific feature which makes it the best ripping software ever. 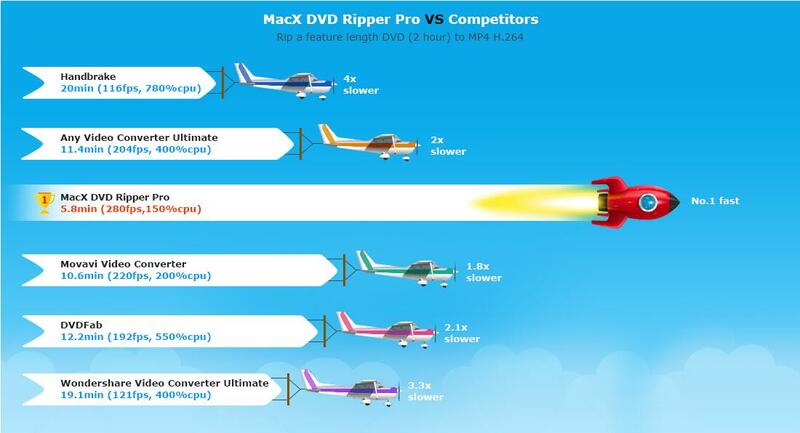 MacX DVD Ripper Pro is the best and fastest DVD ripper for Mac users to rip both homemade and commercial DVDs to any format, be it MP4, HEVC/H.264, MOV, MPEG4, AVI, QT, MP3, etc. It supports every type of knotty DVDs including the 99-title DVD, new DVD, and damaged and unplayable DVD. This DVD Ripper is absolutely the best item in the market that digitalizes DVDs and backups the DVD collections in any of the required formats. This product is a must-have for all Mac users to rip all DVD movies, TV shows DVDs, Disney kids DVDs, Old DVDs, etc to MP4 and various formats for playback on iPad, tablet, iPhone, Android and more devices for enjoyment while going out. 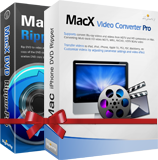 MacX DVD Ripper Pro (Christmas Giveaway Version) is your time-limited chance to get the fastest DVD ripper for Mac that can rip all types of DVDs to different formats for iPhone, iPad, and Android. It is also known to be the best alternative to HandBrake. The ripper is said to be the fastest in this area that is capable of ripping both homemade and commercial DVDs to any of the formats in original quality. It is renowned for supporting every type of complicated DVDs including the 99-title DVD, new DVD, damaged and unplayable DVD. Mac DVD Ripper is undoubtedly the best item in the market today that can easily digitalize DVDs and backup the DVD collections in any of the wanted formats that include DVD to MP4, MOV, H.264, FLV, AVI, QT, MPEG4, and MP3 formats. The HandBrake alternative lets you easily convert DVDs for playback on QuickTime, Android, iTunes, Apple iPhone & iPad, TV, PS4, etc. You also get the option to clone DVD to ISO image at the 1:1 ratio. With the free DVD ripper Mac, you can easily copy DVD titles to MPEG2 and MKV with all videos, audios, and subtitles. The MacX DVD Ripper Pro Christmas Giveaway offer is a chance for you to protect your DVD’s data from scratches or any kind of damage so that it can be enjoyed anywhere and anytime. Looking for a professional quality DVD ripper for Windows or Mac computers, look no further as we are giving away the popular "MacX DVD Ripper Pro for both Mac and Windows" absolutely free. MacX DVD Ripper Pro is just a nice all-in-one DVD ripping and DVD backup software that not allows you to copy DVD content on your Mac as MP4, H.264, MOV, FLV, MPEG, AVI file , but also rip the DVD movie to your iPhone, iPad/iPad 2, iPod, Apple TV and PSP etc. Currently, the latest version even gets an upgrade to support the iPhone 4S and Android based devices, such as HTC, Samsung, XOOM, Galaxy Tab, etc. Now, with MacX DVD Ripper Pro, you can quickly turn your movies into video files and you could then enjoy the countless digitized movies with your Mac or handheld device with ease. What makes the MacX DVD Ripper Pro software a great app to consider is how easy it is to use. Those people who are new to this type of software will be pleased to see just how easy it is to rip their purchased DVDs and convert them to iPhone, iPad, iPod and Android friendly format for convenient playback. With this Mac DVD ripping software application, you could easily rip your DVD movies to MP4, H.264, MOV, FLV, MPEG, M4V, AVI, QT(QuickTime) etc, you are also empowered to edit the video: Trim, Crop and video customization. The trim effect is to get a video segment from the DVD so that it better fits your iPad, Android device or iPhone 4S and so on. By cropping the video, you get rid of the black bar in the video, and by customizing the video effect, you could adjust the decoder/encoder parameters, such as video bitrates, video resolution, frame rate, increase or decrease video quality, change the output video aspect ratio, etc.